Extraordinarily intimate, Oedipus Machina, directed by Ron Sossi, and inspired by Ellen McLaughlin’s adaptation of the Sophocles text, opened this past weekend at The Odyssey Theatre in West Los Angeles. It is a game changer. Spoken in contemporary language, and set in an ancient mysterious place, Oedipus Machina begins smack in the middle of this archetypal tragedy and ends with Oedipus’ banishment. 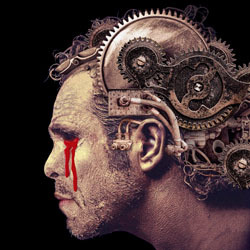 Oedipus Machina focuses on the prime character, and his journey to ultimate self-destruction as a man in search of truth. This piece is endowed with many moving stage parts, and intriguing cinema projections that lead our attention into the story to become part of an inner circle rather than just along as voyeurs, thanks to set design by Keith Mitchell, lighting by Phillip Powers, sound by Christopher Moscatiello and video by Diana Cignoni. These elements alone so dramatically intensified the narrative, it brought about an “other-worldly” state while galvanizing a fiercely strong, in-sync chorus who set a definitively potent physical, verbal and emotional pace, grounding the way for banner performances by Joshua Wolf Coleman (Oedipus), Martin Rayner (Creon) and Lorinne Vozoff (Tirisias). If “the truth will set you free,” for Oedipus, it is a brutal privilege. A plague grips the city of Thebes. Desperate to save his people, King Oedipus sends a messenger to the oracle at Delphi and discovers that the city’s salvation lies in finding and punishing the murderer of the former king, Laius, who was brutally slain by a stranger at a crossroads years ago. When Oedipus orders a manhunt, he unknowingly sets the wheels of his own destruction in motion. Against all warning by prophet, by brother, by wife and by his people, he gives in to a voracious ego and a violent appetite for “The Light” – all but for the truth of his real parentage. Ultimately, it is “The Dark” that he must wither into. For like the Adam and Eve story, and the bite of the apple, when the truth of Oedipus’ real birth is revealed, he and his people gain a heavy, unbearable knowledge, and have lost their innocence forever. Creative, inspired and dramatically accessible. Not to be missed this season! Only one detractor – it’s a bit too long. Shortened by 10-20 minutes it would easily still tell an effective, powerful story. 90 minutes with no intermission had theatre goers squirming just a little in their seats. Choreography advisor is Debbie McMahon.